Micah Barber is a writer, director and producer based in Austin, Texas who makes his feature film debut with his delightful family film about a young boy and his stuffed friend. 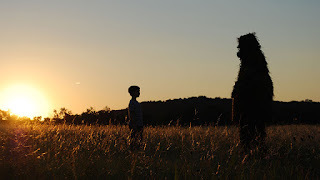 Filmed in Caddo, Texas, the story written with Tony Faia follows Thomas (Bryce Gheisar) as he expands his world view outside of his best friend Felix, a orange stuffed fox. Mom and dad (Lee Eddy and Macon Blair) want to introduce human friends by creating play dates before school starts. Chester (Collin Jarvis) is the typical video game playing future classmate who considers Thomas "odd". When that doesn't work, they decide to send him to summer camp and he is not allowed to bring Felix. Of course he manages to pack Felix in his canteen unknown to everyone else. His fellow camp mates and cabin counselor are challenging to Thomas and not exactly welcoming. He gets a sympathetic ear from the camp cook, who shares his views on the great unknown in the woods. Thomas being a kid with an extremely active imagination, floats across the lake in a plastic tub with Felix into the who knows. Felix is embodied by a human in a bad fitting fox costume (Delaney Wingrove) works as his companion and inside voice to Thomas's decision process. Like being hungry, finding shelter, and maybe suggesting they go back to the camp. But Thomas is determined and resourceful. When they hear a strange sound in the woods, Thomas builds a trap with the marshmallows his dad put in his backpack. What they find is the creature from the camp fire tales, a tall tree like being who can magically make things grow. Reminded of what his mother had said, that to make a friend, you have to be a friend, the totem, Felix and Thomas have an adventure that helps Thomas begin to accept that he needs to give up his stuffed friend and maybe return to real life. Bryce Gheisar who was recently seen in A Dog's Purpose, truly brings Thomas to life without making him the typical bratty kids full of himself. Thomas is a smart kid, but with no real social skills. Trying to fit in seems so stressful, when there is his Felix who will play anything at anytime. Thomas has to learn to give up his crutch that keeps him from normal interactions, and accept that being with other kids is more fun when they stop teasing and give him some cred. Growing up is a scary prospect and this film is for everyone who has ever had a stuffed or imaginary friend and the comfort they provided.